We don't have any trips to French Polynesia at the moment . To travel to Polynesia is to enjoy the jewels of the Pacific, in the most remote and beautiful islands of the world whose culture, natural environment and seabed have captivated many explorers. Its name means "many islands", and it is composed of more than a thousand located mainly in the south and in the center of the ocean between Hawaii, New Zealand, and Easter Island. Right in the center is Tonga, Samoa, the Cook Islands, and French Polynesia. In this last archipelago is where Tahiti is, the most famous island of the archipelago, Islands of the Society, to which also belong Bora Bora and Moorea, known as honeymoon destinations. 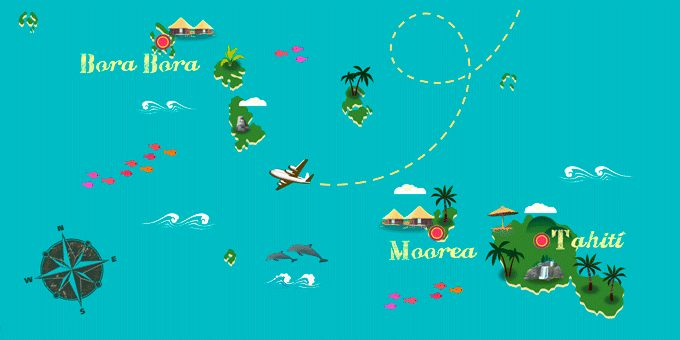 Polynesia also includes the Marquesas, Tuamotu, Australes and Gambier Islands. The main characteristic of all of them, apart from their nature, their coral reefs or the volcanic zones, is that this is where the daily date change takes place as the meridian line is located here. These Polynesian gems are ideal for trips as a couple or with friends. Activities such as hiking, diving, enjoying the sun and beaches, as well as relaxing in luxurious over-sea hotels are just some of the things to enjoy whilst visiting Polynesia. Passport with a minimum of six months validity with one blank passport page. There are 118 islands and atolls. If French Polynesia has caught your attention, leave us your number so we can call you to discuss the voyage that awaits you.